There are 3 reviews of Scuderia Ferrari. I wanna start the review by writing that, in the body of this unexpectedly beautiful fragrance, the calibration of citrus, spices and herbal aromatic notes is one of the best ever experienced in my humble olfactory adventure, something finally almost breezy-powderish and diaphane. Really I didn't expect such a "simple perfection". Scuderia Ferrari is simply a beautiful and well constructed modern aromatic fougere (casual and gymnic-dynamic) finally surprisingly smooth and silky. This is a classic fragrance almost impossible to be not enjoyed while worn along a spring time sweet day. A really airy and clean accord of citrus, aromatic notes, sharp floral elements (hyper virile geranium), musk, spices (pepper, cardamom, a touch of cinnamon as well?) and smooth tonka. The aroma is freshly gentlemanly and kind of slightly exotic-barber shop a la Aramis Havana (conceptually most of all) and with nuances conjuring partially scents a la Casamorati Fiero (less spicy and more classic herbal), Mark Buxton Black Angel (more darkly floral but equally gingerish-cardamomish), Bvlgari Pour Homme (more tea-oriented), Cartier Declaration (more powerfully gingerish/cardamomish, if possible), Versace The Dreamer (due to a similar combination of aromatic notes, citrus, lavender, amber, geranium, cedar and tonka, despite the Versace's one being more tobacco oriented and kind of oriental while the Ferrari's one being clearly spicier and more freshly aromatic) or Ferrari Red classic (more floral, woody and soapy). The opening is conventional but quite inebriating, green/hesperidic, pungent and sparkling. Lavender, carnation and woods unfold a quite traditionally classic woody-floral-aromatic aura despite the juice be appearing by soon less conventionally spicy-fluidy, modern-casual and slightly tonkinian-exotic. There is a tad of tart saltiness deriving by zesty citrus, fizziness, floral intensity, cedar and may be vetiver. Dry down is so musky, so gingerish, so smooth, so vaguely silky-soapy, so tonkinian and spicy. Cardamom is the key note and its (really similar) combination with citrus (lime and orange/neroli), aromatic herbal notes, pepper, spices, ginger, sweet spices, amber, tea, cedar, tonka and oakmoss "points out" this juice as one of the closest "perfumed things" to the Ellena's masterpiece Cartier Declaration. The latter is finally slightly leathery, more floral and sophisticated while the following Scuderia Ferrari is more musky, woodsy, warm (fresh/simil organic) and aromatic. Another juice jumping decidedly on mind (due its accord of pepper, cardamom, mild spices, musks and tonka) is the spicy bomb Frapin L'Humaniste, a juice quite unbeatable in fresh-fluidy spiciness. Along the way a soapy accord of tea, ginger, cardamom, minty-aromatic notes and tonka jumps permanently on the stage as gradually darker, more musky, sharply floral and herbal. In this phase the aroma is less citric/spicy/herbal (less tipically fougere) and finally more subtle, dry-poudre, musky-minty and woodsy. Amber in this phase imprints the right dose of warm virility (counteracting the general aromatic freshness) and overall is anyway still influenced by a general fougere "dry spices/lavender/aromatic-anisic pattens centered" atmosphere a la classic Azzaro Pour Homme. Yes, not properly a crowdpleaser but a juice exuding a sort of aromatic optimistic brightness which is impossible to be not captured by. Frankly, despite the plain use of synthetic, I don't particularly notice an aromachemical-centered obsessive presence. Finally pink and red pepper arouse in the air a pleasant subtle "molecular glitter" decidedly turning on "the spirit" and despite the basically mellow-soapy-powdery consistency of the base. 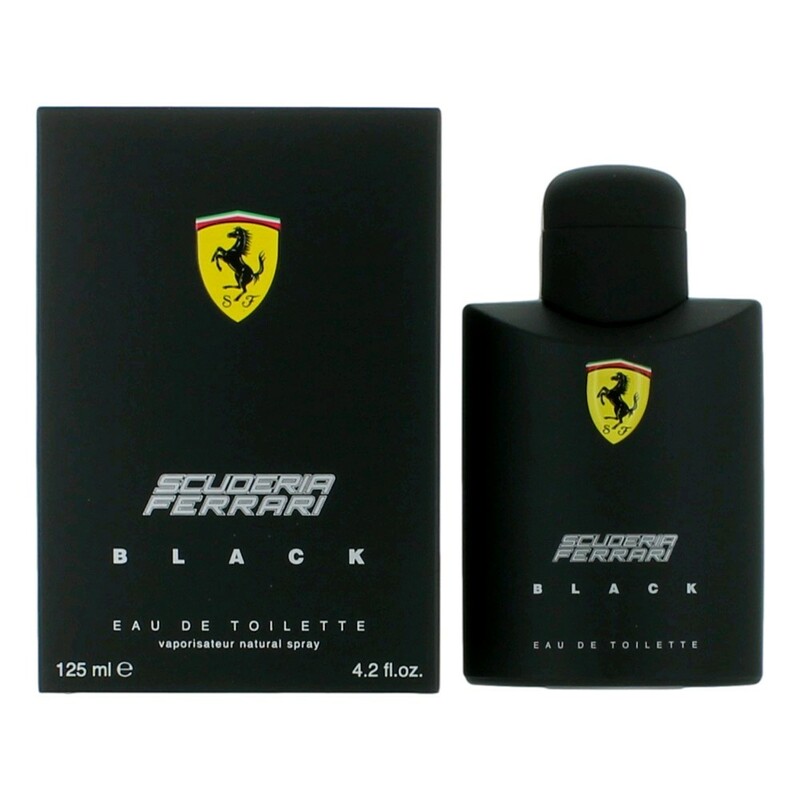 Despite the lack of innovative creativity and a surely yet experienced main structure Scuderia Ferrari stands out as an excellent office/day time fragrance perfect for the spring/summer seasons of the southern lands. This could easily pass as unisex, maybe because of the prominent tea and green mandarin? Soft and yes, synthetic, projects well though. I've smelled this before I believe. This is a scent that I just might not miss when I'm finished with it, maybe a little too feminine. Well, this was unexpectedly nice. The opening is as much conventional and synthetic as pleasantly bold, and also slightly less predictable than one may assume; the structure is of the traditional mens’ woody cologne, with citrus notes on top, carnation and lavender, mossy woods on the base (I get cedar, a salty feel of vetiver), and gallons of norlimbanol with its signature woody-chemical-rubbery-smoky-onesizefitsall note giving Scuderia the seal of "modernity". Now the “uncommon” part is a nice gentle accord halfway fruity and green-floral, which I was not able to identify until I read composition: it must be centered on tea, most likely. It brings in a mellow, pleasant silky, sweet, slightly fruity feel, plushy and crystalline, green but warm, which “breaks” the linearity and the predictability of the scent, giving it a more peculiar touch of colour. After one hour or so, the transition towards the drydown makes Scuderia Ferrari smell even better: softer, more aromatic, lighter, more warm and ambery, with the green-tea note emerging together with a pleasant and cozy soapy breeze, while the synthetic-woody base softens and becomes more subtle and tamed down. I must admit that at this stage it’s a totally respectable and pleasant scent to wear. A modern “aromatic fougère” scent with a sweet heart. Surely hyper safe, uncreative and a bit cheap as regards of the materials used, so don't expect anything special or breathtaking; but it perfectly reflects its price, so... Let’s consider it an inexpensive yet totally decent crowdpleaser which does its job with respectable unpretentiousness, with nothing to envy to far more expensive – but totally similar – fragrances (like Bleu de Chanel, for instance).